A happy welcome to Uniko Studio! Hooray! The day has finally arrived that Uniko Studio is here for real and can reveal to the world its first two stamp sets called Time and Extra Time! I can't wait to show you what inky adventures I've been on with these two sets. These stamps take ink and stamp like a dream! They take both dye and pigment/chalk inks very well and give fabulous results. Rest assured that here on my blog, I'll never endorse anything doesn't meet my own high (and at times perfectionist!) inky standard. So that's enough gushing on how fabulously well these beauties stamp; lemme show you what I've made! So in keeping with the theme of time, how about a clock? This would make a not only a super classy birthday card, but an invite too methinks. I simply inked up those different clocks with different colours to create the background and stamped the sentiment over the top. To finish I mounted the card onto some scrummy, polka-dot Pink Paislee paper I've been hoarding to tie in with the circular clock faces. Now to tie in with the whole idea of those cogs being the internal workings of an instrument, I decided to brave a vellum card-base to echo that kinda internal feeling. PTI Vellum works pretty well for this as it's very sturdy and I kinda like the extra dimension it adds. I couldn't resist inking up the three different sized geometric flower designs from 'Time' in Versamark on vellum, dusting each one with chalk and cutting a layering them to create a pretty embellishment. Love your cards Amy! The sets look very male-orientated at first, so the soft, girly feel of the pink card really shows the versatility of the stamps. Wow you've really done a fab job with these stamps Aimes. Particularly like the friend/sympathy one. I did leave a comment on the company blog but I think blogger might be playing up on me :( Cracking start! Super fabulous designs and what a way to introduce a company! Beautiful! I really appreciate how you've covered both the masculine and feminine side of things. love how you worked your aimes magic on those stamps! awesome design with the time and extra time stamps. love the soft color you used too. Wow I don't know which card I like best. Each one I kept loving more, lol! Love your clock in your home too, I love clocks too! These all look gret Aimes, those cogs are my fave! Just checked the site out and it looks so cool. Wow! These are amazing...I love how you showed the versatility of the set! Off to pop over to the shop to nose around! Fabulous job Amy with this first set of stamps! I really love your second card--that sentiment is so great, and I love the layered clocks you stamped and the colours you chose! Congrats on the new DT gig! You are certainly an asset to any team with your fabby creations! Awesome time cards! 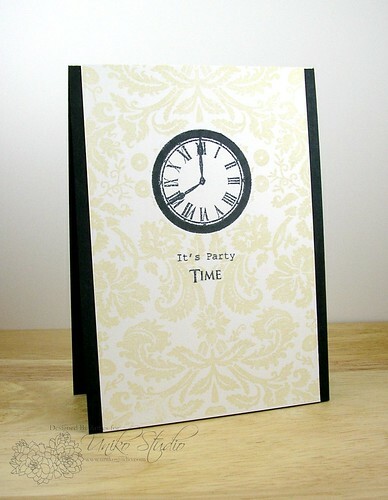 Who doesn't need a little extra time especially if it coincides with inky time? ;-) Fabulous cards, Amy! These are really lovely sets, and you've done a fabulous job introducing them! 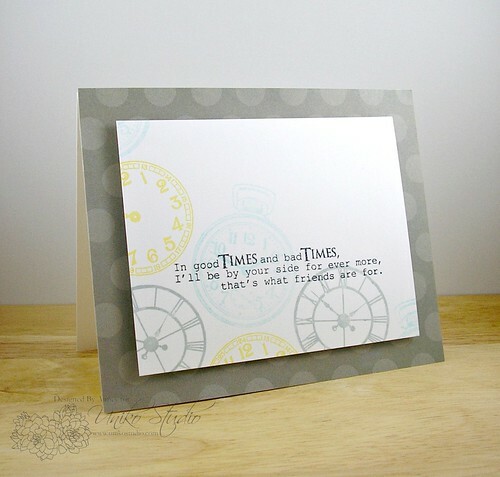 I especially love your second card with the soft stamping of the different clocks behind the sentiment and the polka dot card base. This new company is lucky to have your talent! Fabulous cards my dear! LOVE them all! You and Uniko are like pb & j! 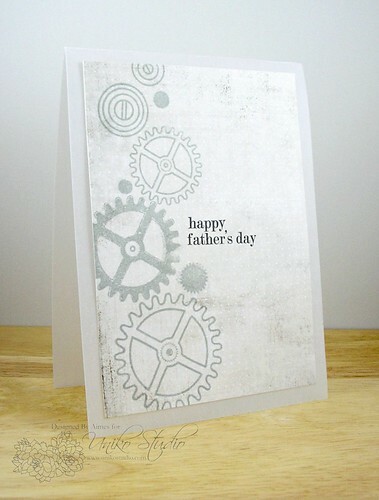 Love all these projects Aimes but my favourite has to be that cogs Father's Day card! I need to hunt for that patterned paper now! *THUD* Ok, let me pick my jaw off the floor. WOWOWOWOW!!! Aimes, all of these cards are fabulous, magazine worthy, stunning creations! Every last one! Love how you used this set to make such varied products - I stand in awe yet again girl! 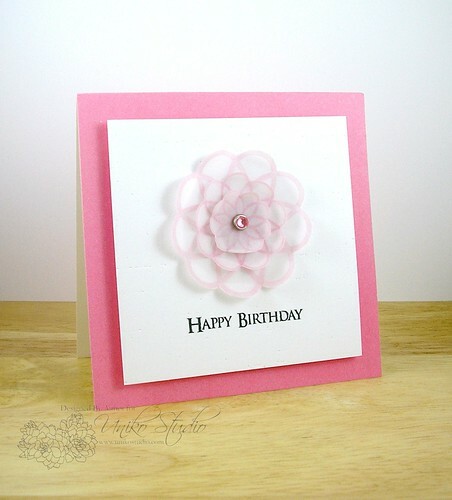 wow I love what you've made with the new stamp sets Aimes! Icy Cold Weather = No Card!